Spook in the Stacks is an entertaining cozy mystery. It is the fourth Lighthouse Library Mystery. The Bodie Island lighthouse library is located on the Outer Banks of North Carolina. Rich Jay Ruddle is looking for somewhere to house his historic documents. The library and a local college are in the final round. At the same time, the library is holding several Halloween events in the days leading up to the holiday. During the first event, a murder occurs in the library. I only read the third in the series before this one. However, I had no problem keeping up with the large cast of characters and the characters are the best part of Spook in the Stacks. Everyone, even the difficult Louise Jane, are clearly differentiated and have reasonable motivations. Teddy takes center stage in this series entry. But Lucy and Connor’s relationship are also featured. There is a paranormal element that is not resolved that hopefully will be revisited in book five. 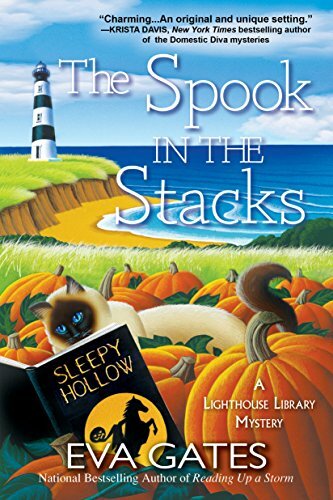 Spook in the Stacks is a fun mystery for cozy fans. 4 stars!